Friday night live at Transistor: oRSo and Whirlpool. Sound by Jon Monteverde. oRSo has been the project of Phil Spirito (Rex, Loftus) since 1998. Over the last 12 years there have been many recordings and even more incarnations of the band, both instrumental and with vocals. oRSo has been described as carny folk, weird folk, twisted Americana and, lately, jazz folk. Also available: a previous oRSo Transistor performance from February 8, 2013. 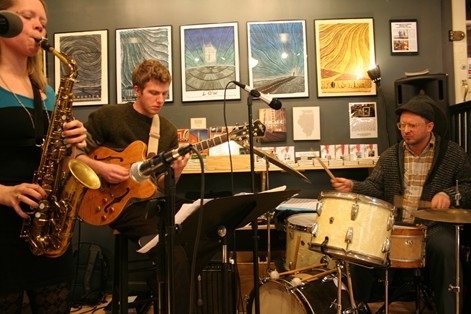 The trio Whirlpool came together for a house party concert series in Chicago, featuring Caroline Davis on saxophone and vocals, Jeff Swanson on guitar, and Charles Rumback on drums. As a bass-less trio, the music has a certain weightless quality to it. All the members of the group compose original pieces for the band, creating the sound for their debut album, "This World and One More." Caroline Davis is a saxophonist and vocalist currently living in New York. She has shared the stage with jazz greats Matt Wilson, Ellis Marsalis, Bobby Broom, Dennis Carroll, Von Freeman and Tom Garling. She also finds a creative outlet performing in Chicago-based world music group Fatbook, hip-hop group Deep Fayed, and folk-Americana group oRSo. Charles Rumback is a Chicago-based drummer known for his work as a collaborator with Colorlist and Stirrup. In addition to leading his own quartet, Charles frequently works as a sideman with artists such as Angela James and Fred Lonberg-Holm. Jeff Swanson began an active career as a guitarist living in Chicago. A contributor to the jazz community, Jeff performs with various groups including the Artie Black Three, Christopher McBride Quartet, Quentin Coaxum Quintet and the Adam Thornburg Group. 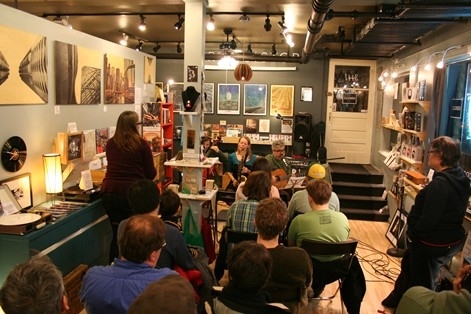 Also available: a previous Whirlpool Transistor performance from February 8, 2013.